Pymnts.com reports that electronic payments are rising, according to a Viewpost study. Small and large businesses are recognizing the advantages of electronic payments. 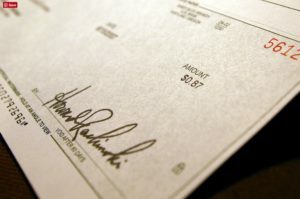 Every single one of the business owners surveyed by Viewpost said they continue to write paper checks to pay suppliers! The most common reason? Their suppliers don’t accept electronic payments, according to 41 percent of survey respondents. But a lack of hidden fees, the easily tracked paper trail and the ease of use associated with checks are all top reasons they have persevered. Simply said, paper checks as basic tools are far, far from displaced in the collective consciousness of businesses. But, ponder this: Paper checks are considered favorable among corporate buyers because of the few extra “float” days before their money leaves bank accounts – – but only 1.8 percent admitted this as the top reason they use paper checks. As long as this outlook prevails – – and it seems that paper checks are not disappearing as fast as some would like. Needed to support this continued market presence are powerful check recognition and validation tools, vital to enterprises in reducing risk, preventing fraud and keeping their operating costs low. Are electronic payments where we’re headed? Certainly. But innovations in check will insure we have few years of managing paper payments ahead of us!